The day I purchased him, he seemed to be calling my name. I resisted at first, considering what others may think when they saw a monk, on a spring, stuck to my dashboard. Then I thought about the Hawaiian girls that people used to put on their dashboards and decided that a monk was not so bad, and ya know what … who the heck cares what everyone else thinks. We were destined to be together. So why is he my idol? I’m glad you asked! Amidst all the madness, as he bounces and bounces he remains peaceful and calm; through potholes and all! This past Sunday I was in New York City as part of a volunteer effort to help feed the homeless and hungry, and as I sat in my car outside the Port Authority, waiting for my fellow team members to make their rounds, my attention was especially drawn to my blessed monk. As bright lights from massive electronic billboards repeatedly lit up the sky, messages flashed and traffic whizzed by, my idol just sat there. At peace amidst the madness and chaos. Content on my dashboard where it seemed he was meant to be. I couldn’t resist but to snap a photo as proof of the beautiful moment. “Yep, I need to be more like you,” I said to him. I’m pretty sure he nodded yes in response. It may have been from the vibrations of the traffic whizzing by or the sounds of the city, but I like to think that we had a moment. As if he was confirming that I was on the right path, headed in the right direction. 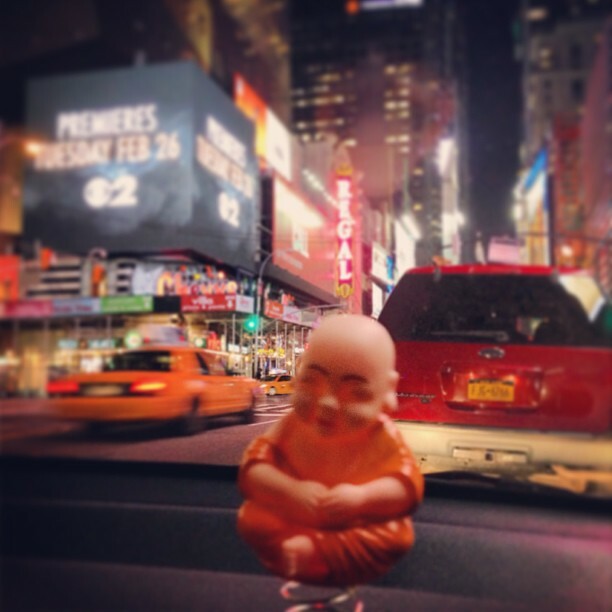 Tags: Dashboard, dashboard monk, idol, inspiration, meditation, Monk, New York City, NYC. Bookmark the permalink.